"We must exercise the greatest care of the young"
We believe we have a responsibility to provide care and education for children in a loving Community as they discover God's world and their place in it. We believe in providing children with opportunities and encouragement to develop their individual abilities and talents in a Christian environment. We believe in valuing the unique diversity of our children, families, colleagues and community, and to treat all with respect, integrity and fairness. We believe children learn best when provided with a safe, secure and loving environment. We believe in developing strong parent-partnerships built on mutual respect and trust, to work together with families to achieve the best possible learning outcomes for their children. We believe in nurturing the holistic development of each child. We believe that children's learning is enhanced through the provision of a play- based curriculum that supports learning through self-discovery and intentional teaching approaches. 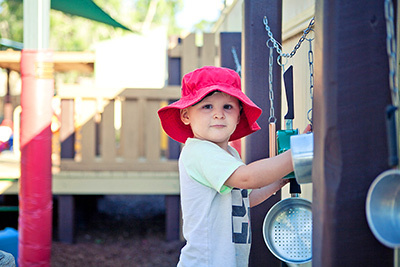 We believe that the high standard of quality care and education provided by the Living Faith Early Learning Centre provides the foundations for future learning success. We believe that through the provision of a natural environment children are provided with opportunities to develop their knowledge and understanding of environmental awareness and sustainability.